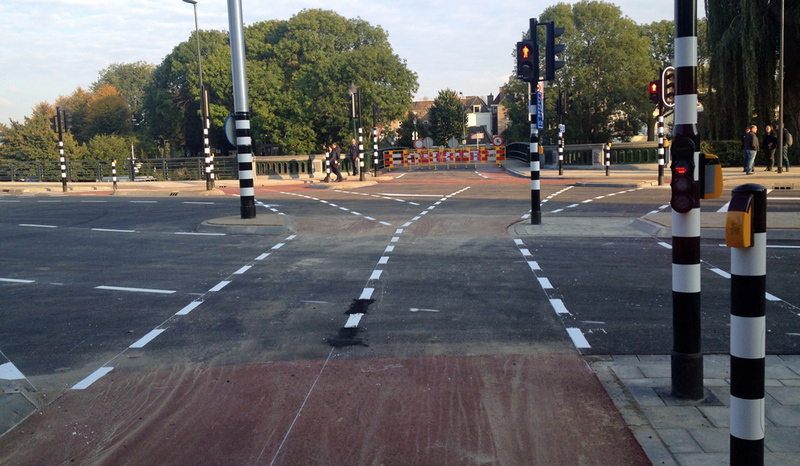 The city of ’s-Hertogenbosch upgraded a protected intersection. It used to be partly protected, with long diagonal cycle crossings on the carriage way, but it now became a fully protected intersection. This new bi-directional cycle crossing came in the place of a long diagonal crossing. It is combined with a pedestrian crossing. Pedestrians were not allowed to cross the street here before. This upgrade was especially an improvement for both cycling and walking. The reconstruction of Brugplein in ’s-Hertogenbosch took place already in September and October 2015. The whole intersection was replaced in a little under three weeks, during which it was completely closed to all traffic. The former design of the intersection felt very old-fashioned. It was partly protected, but especially the left turns had to be made in a peculiar way on your bicycle: diagonally and on the carriageway for motor traffic. All motor traffic had to be stopped to let cyclists make their left turns. That is how “all-directions-green-at-the-same-time” works. But it still surprised me to find a picture that showed this actually was an “all-directions-green” intersection in the past. The ’s-Hertogenbosch city archive has that picture from April 1993 on its website. It must have been a short-lived experiment; the city no longer has such intersections and doesn’t want them either. They prolong the total light cycles and that is unnecessary. The intersection has five arms, two of which lead to bridges. Hence the name “Brugplein”, which literally means Bridge Square. It was turned into a five-arm roundabout when the largest bridge, a then new main route for motor traffic, was opened in 1941. Already in the 1950s, one of the arms was closed to motor traffic. That street provided a shortcut for motor traffic that the city did not want the main traffic flow to take. Traffic calming and traffic diversions have been common in the Netherlands for a very long time. The wear of the street in the old picture shows that the main traffic flow is in one dominant direction. In that case a roundabout is not such a good idea. 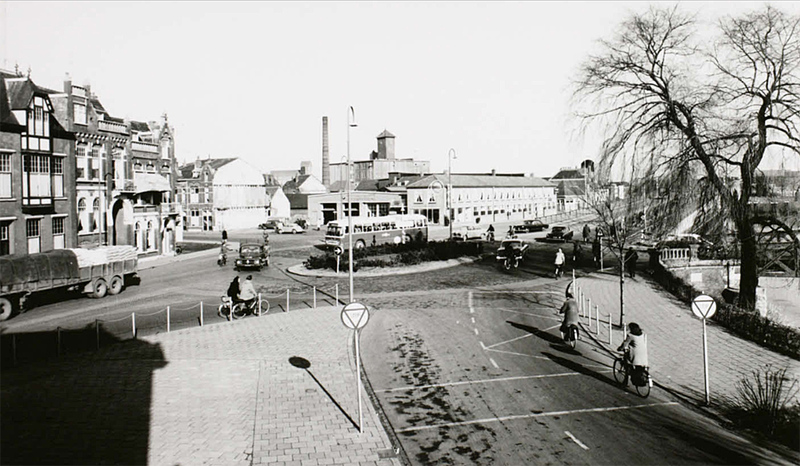 Indeed, the roundabout disappeared well before the 1970s, when the square became a signalised intersection. 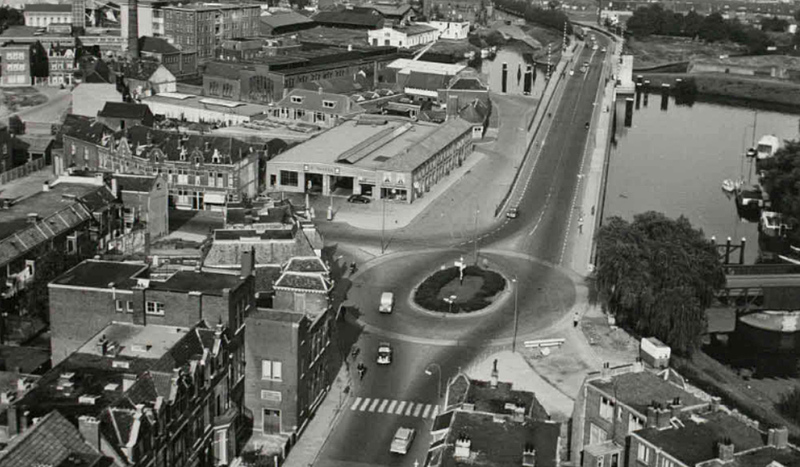 Brugplein in the late 1950s, facing north, with one street closed (the one to the south-east). The wear on the street clearly shows the dominant traffic flow. Picture: city archive of ’s-Hertogenbosch. The city now also wanted to further restrict access to the smaller bridge, leading into the city centre, as part of traffic calming on the city centre ring. It was already forbidden to enter the bridge from the west, but motor traffic can also no longer turn onto the bridge from the north. This meant the left-turning lane could be removed. The city wanted to make the intersection better for walking as well. Not all streets had pedestrian crossings, they do now. Last but not least, the city wanted to make the square better for cycling. The space that became available after the left turning lanes were removed was partly used to widen the cycleways and to make them bi-directional. One pair of diagonal crossings was straightened out, the other now has a centre traffic islands. This improves the intersection for cycling. The bi-directional cycleways make it possible to reach the long closed street on your bicycle. That had never been possible, unless you rode against traffic or on the sidewalk. This is still an unusual diagonal crossing, but it has been made safer with a traffic island in the middle. Cyclists are allowed to go in three directions from that island. Left, straight-on and right. One of the traffic islands during the construction works. 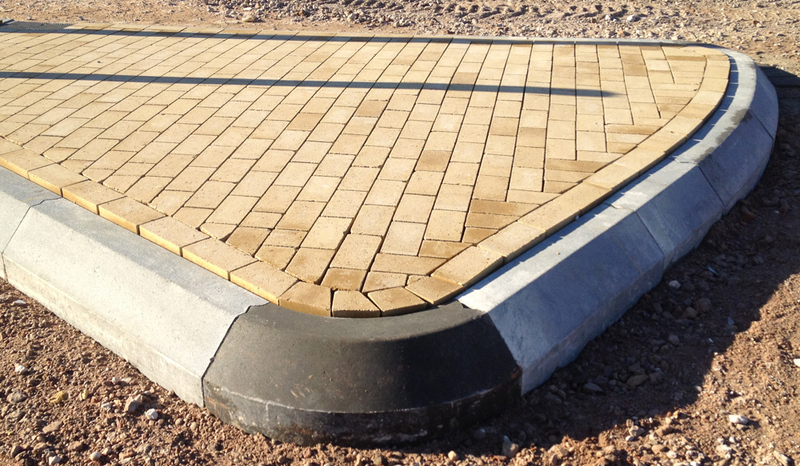 The combination of pre-fab kerbs (curbs) and yellow pavers give a high quality result. The final road surface will have reached the top of the vertical part of the kerbs. The five arms of the intersection are reflected in this part of the cycleways. This is the situation right after the final layer of red asphalt was put in place. The same location with all the lines and road markings in place. The shark’s teeth indicate which path has priority. 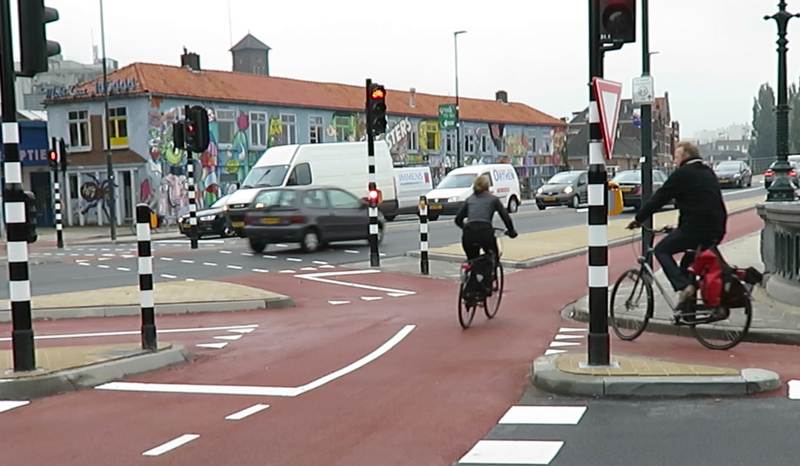 The lights only regulate crossings with motor traffic, not the ones for cycle traffic only. Two left turns in the before and after situation. It is clear that these crossings are much better protected now, especially when you compare the red routes. The route of the green line can be taken in both directions now. That means the street in the top of the picture (starting at the beginning of that green line) can now also be reached in a legal way on your bicycle. These two left turns had to be made on “motor traffic space” in the before situation. In the before situation cycling was not guided by lines, so cyclists had to be careful not to collide head-on. The crossing is now better regulated and protected and has a traffic island about midway. This unusual diagonal arrangement is only possible because motor traffic is not allowed to go straight-on from the bottom of the picture to the top, nor to go left from the left hand side of the picture. I use this intersection quite often, both on a bicycle and sometimes even in a car as a driver. That this protected intersection is a bit strange, with the diagonal crossings for cycling, is not something you notice when you use it. The protected intersection is so well-known and so standard in the Netherlands, that slight variations are very possible, without negative consequences for the safety of the traffic users. My video explaining the reconstruction of the Brugplein in ’s-Hertogenbosch. Two rides (left turns) traversing this intersection in the before and after situation. One of my readers asked on Twitter about traffic volumes, especially cycling compared to motor vehicles during the day. Eric Greweldinger, the traffic light expert of the city of ’s-Hertogenbosch, was so kind to provide information gathered from the traffic lights loops in an average week in October 2016. These figures are meant as an indication of the volumes and how they are spread over the day. Especially for cycling it should be mentioned that not every cyclist is not always measured individually, there is a margin of error. However, as an indication these figures give some good information I think. Number of Motor vehicles measured at Brugplein in a week in October 2016. Number of motor vehicles passing Brugplein for some directions on the Monday of the previous chart. These figures are meant to give an indication of how motor vehicle volumes are spread over the day. i’m always astonished by the construction techniques and time it takes to finish a street project in the Netherlands. This major redo of a street took three weeks. Its taking four weeks to do a normal resurface of a street in the city of LA. There is going to be a major increase in the miles of streets repaired that are in a fail condition in LA which require complete removal of all asphalt. I’ve mentioned to government employees at a meeting that all utilities located under the street should be repaired at the same time. Unfortunately that’s not the standard way of doing it. Currently it seems to be wait until something fails, then repair it. That’s why most miles of major streets in LA have scars from utility repairs. I’ve been wondering the last few days why so many people own cars. I don’t own an airplane and yet that doesn’t prevent me from using them. A electric assist bicycle will get you to a nearby destination almost as fast as driving and yet you don’t have to pay for bicycle insurance, nor does it require a license. The cost difference between owning a car and a bicycle is hundreds of dollars a month. I’ve also recently noticed that a large amount of people are visiting the local library to use their internet service. That’s another way to lower monthly expenses and yet its something most people don’t take advantage of. Its a tough sell to get people to break the habit of driving everywhere. I know several young people who get their car out of the garage and drive across the street to buy something as simple as water. It looks like it will take at least 5 weeks to complete a routine street repaving in my area of LA. It takes 7 years to build a light-rail line or extension from start to finish in LA. Currently new rail lines are opening about every three years. I think the biggest reason it is not common to repair or maintain underground utilities during road reconstructions for the U.S. is because the infrastructure is owned by different entities, some public and some private, and coordination between roadway reconstruction and utility maintenance is very complex. Also, we Americans are not very good at tolerating complete shutdowns of infrastructure: roads, transit, airports, you name it. Residents, businesses, politicians are all asking that the project be done yesterday, tomorrow, piecemeal, on weeknights, on weekends… Given that, I can understand why municipalities make their own decisions and do their own work on their schedule. That said, I think our municipalities should try to coordinate when possible, and when the roads are inevitably torn up to repair something, the municipality should be right there ready to inspect the utility company’s handiwork at getting the road back the way it was and if not, force them to come back and do it right at their expense. we had a street re-paved, nice and smooth! then ripped up by gas utils 6 weeks later. now all bumpy and crap! argh! The curb ‘bump out’ at 3:16 of the video may pose trouble. It seems like a well designed single lane roundabout could still be an alternative- compared to the amazing amount of paint lines, sharks teeth and signal schemes. Unbalanced motor flow need not rule out a roundabout. None the less, it’s impressive to see so much effort put into making a signalized intersection flow better and with increased safety. Our staff recently toured parts of Dutch and Danish cycling cities. We are looking to implement successful initiatives here in the U.S. I talked with a crash investigator in Amsterdam. He estimated that ten people on bicycles a day were hit by cars in the city. He thought almost all of those crashes occurred at traffic signals and none at roundabouts. Granted, there seems to be many more traffic signals than roundabouts in Amsterdam. That’s a very interesting observation. As a cyclist in Amsterdam (and before that in other cities in the Netherlands), i’ve been involved in several incidents on roundabouts (none really serious, but twice leading to the write-off of a bike). I’ve never seen or had any incident at a traffic signal. I’m curious why the statistics would be so different from my observations. I was bicycling through an intersection without stop signs are lights and got hit by a car. I and the bicycle were wedged underneath the front of the car. Thankfully, I just got bad road rash on my knee and a shoulder injury to this day gives me regular discomfort. The bicycle was not so lucky. I have also seen other bicycle accidents and all were not at traffic signals. In Belgium I have noticed that every several kilometers or so there is a photo, usually of a young man, posted to a tree or post. Most of these locations are on separated bicycle paths, not at intersections. I hate to say it but bicycling is very dangerous, anywhere, anytime. Still, I will ride every day! That Priority Square that Mark shown a couple weeks ago for the ring road downgrade (or thinking like Mark, upgrade) in Utrecht could prove to be more useful, although it seems like the middle thing needed 10 metres of width, it might go down to 6 metres, but I have my doubts about this particular location. 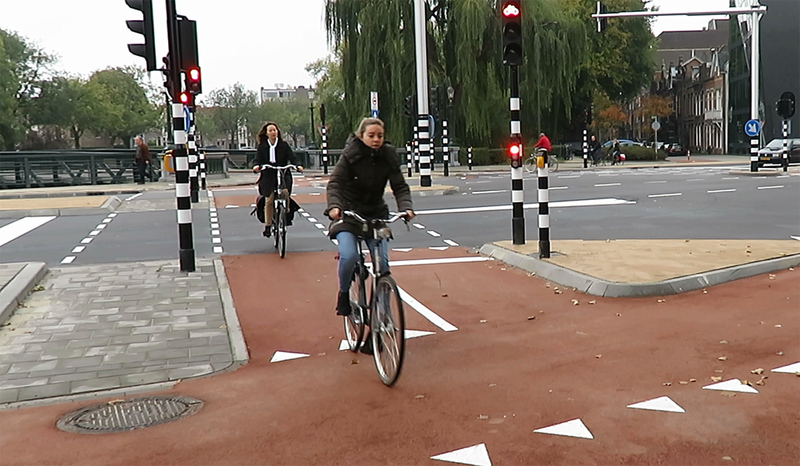 Also, Amsterdam’s intersections aren’t nearly as protected. They tend to be advance stop lines for cyclists with a mirror, a right turn free for cyclists sign maybe, a cycle lane that frankly is rather narrow, usually 1.5 metres, possibly less, actual protected intersections are a lot less common, although they do of course exist too. As amazing as Amsterdam was when I visited, new herbal smells, beautiful old streets, feeling like walking and cycling were legit forms of transport, beery aromas, I did not like very much this lack of protected intersection system. It might even be ready Amsterdam is for a whole 30 km/h zone within the A10 ring road, maybe with the exception of 4 lane divided arterials at 50 km/h. Apparently, you’ve only seen parts of Amsterdam. It’s very different in some neighbourhoods. Unprotected lanes are mostly city center and oud-zuid, while oost is better, and west is even better then that and has very few unprotected lanes (all within the A10). Outside of the A10, it’s all protected, as far as i know. This bump out is designed with a purpose. 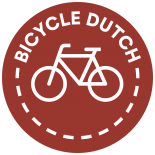 It is to create attention for the bicycle intersection where you have to give way to cyclists on the bidirectional trough bike path which follows the curve into the side road. Yes, I understand and agree with the purpose of the ‘bump out’. 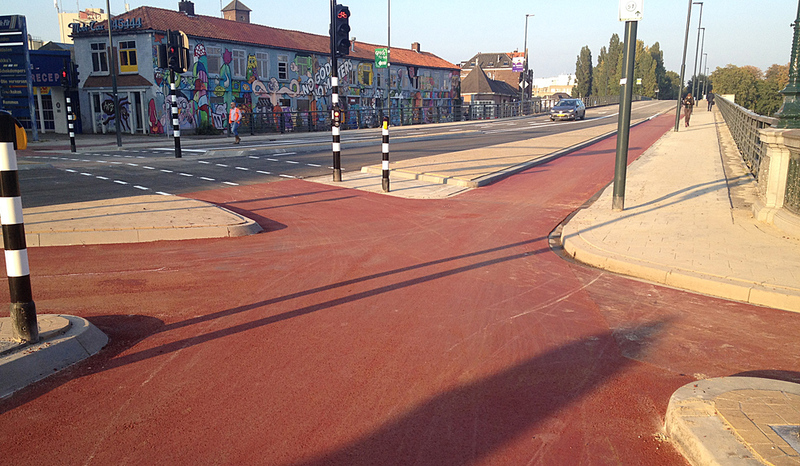 It seems that there could be a more ‘elegant’ solution than a bump of concrete curb. Will snow, ice or heavy bike traffic make the ‘bump’ invisible? There is likely not room for a mini bicycle roundabout and a stop sign would likely not work either. Perhaps a flower planter or some other piece of beauty could give more definition to the ‘bump’. Amazing to see the quality of work that goes into these makeovers. Fixing the whole street and sub-surface in one go makes so much sense. Vertical curbs next to cycle paths, what are we, London? Please read carefully. Not vertical curbs, but the vertical part of the curbs. 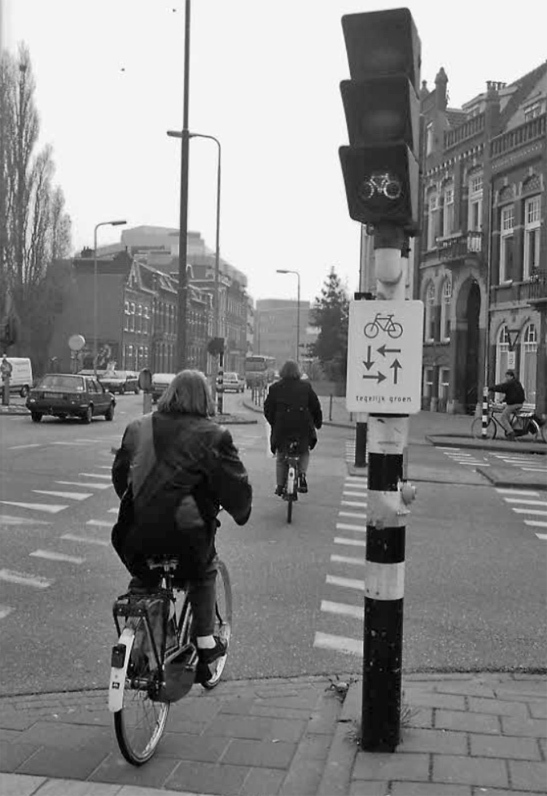 This entry was posted on 28 February 2017 by Bicycle Dutch in Original posts and tagged ’s-Hertogenbosch (Den Bosch), before and after, junction design, protected intersection.